"There is a coincidence of similar inspiration in three of the current one-man shows. (re: New York City shows, November 1959) All are in a large sense composed of abstract-expressionist art. That of paintings by Hugh Mesibov, at Gallery Mayer, is by far the most stimulating with its large applications of swirling color, symbolizing perhaps, such elemental forces in nature as the drama of the sea and skies. For Mesibov, a Philadelphian, who is having the latest of several shows here, deals in abundance of feeling more than actual definition. And many a handsome combination figures boldly in his color harmonies, which are extremely impressive." 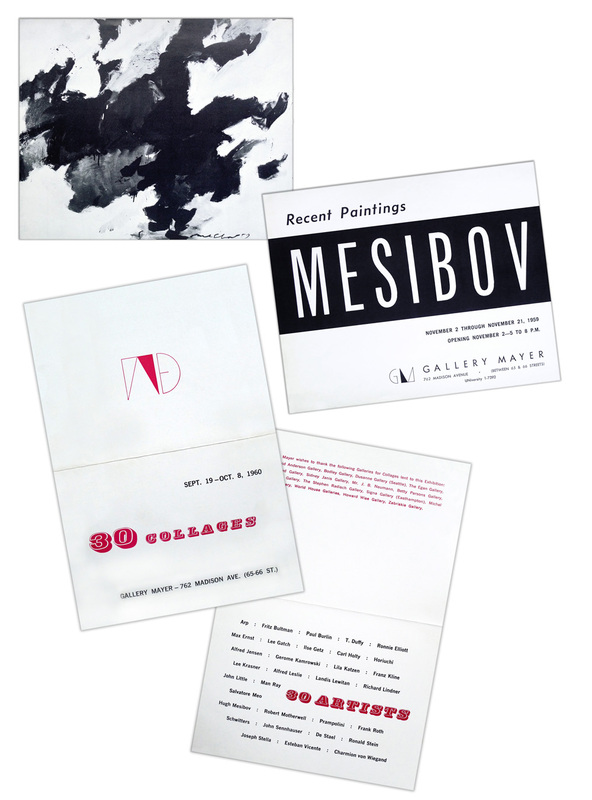 Mesibov, exhibiting along side 29 other artists including Max Ernst, Lee Gatch, Franz Kline, Lee Krasner, Man Ray, Robert Motherwell, Joseph Stella, in a multi-artist show of Collages.